Anyone who surfs the web on a regular basis can probably remember the very first time they fell victim to an attempted scam. When the internet first went mainstream, pages were flooded with pop-ups promising things like luxury cruise holidays, telling us we were selected as the millionth visitor to a site, and if we just input our details we’ll be the lucky recipient of a great free handout. As people got wise to the rather basic scams out there, the scammers took notice and began to evolve. They used more and more definitive internet marketing techniques. As human beings, we all obviously love the thought of getting something for nothing. This is how scams work; they capitalize on our in-built hope that we may one day win something, or come in to a windfall. This is a natural reaction to have, and this is what makes scams successful on an ongoing basis. A friend of mine had an elderly grandmother who got scammed to the tune of thousands, because she subscribed to a service which promised to deliver massive jackpot cash prizes, if she invested a small amount of money. The family is still paying off the debts incurred by this lovely woman, who simply hoped to be able to land a cash prize big enough to set her relatives up for the future. The internet is rife with offers from scammers, posing as legitimate businesspeople. Money laundering deals come in to my mailbox on a daily basis, promising that I can make a small fortune, simply by inputting my bank details. Another great scam is the e-mail that arrives asking me to confirm my bank details, for the purposes of enhancing my online security. Unfortunately, most of us learn the hard way to remember if something looks too good to be true, it probably is. My early experiences of online scams have taught me to check things carefully, and I now have a built in monitor which alerts me when something seems suspicious. When I set up my on-line business, I decided to be one of the good guys – to only offer products for a reasonable price, and commit to providing an ongoing service that reassures people that I am there to support them. When I launched my blogging course, I vowed to keep costs low and service high, to work towards restoring people’s faith in online businesses. The course is now re-launching, and I hope I’ve proven that there are some good business people out there, even online, that can provide a product that does exactly what it promises. Now, if you send me your bank details and deeds to your house, I can help you optimize your blog. Alternatively, check out my blogging course by going here: Blogging Course and sign up without giving away all your worldly goods! Ever been scammed? Please share your views in the comments below. Oh the spammers and the phishers. It’s getting worse. Now they are coming from supposedly Paypal, Bank of America, Visa, AOL. What is scary is, in many cases, they have the last four digits of my credit card # and the last digits of my checking account. Their message is usually I am overdrawn or there is fraud on my account. Then they say “click here.” No way. I do more than just delete them. I actually call the company and get their fraud email and forward them. It takes a little time but if they don’t know about it, they can’t stop it. They told me they were issuing a new card for fraud. A charge for $20. It is such a pain in the neck to inform all your automatic pays of your new number. I said – just credit it. They said they were watching this source. Their game is to put through a small charge to see if it will take and then they go gangbusters. Things are getting so dangerous out there. What is the answer? .-= Corinne Edwards´s last blog ..A PUBLISHING DEAL – YAY! – now what? =-. Certainly don’t click on any emails you don’t recognize – even from legit companies. The scammers make them look so good these days. If a company wants me to do something – write to me or ring me up. And check all your statements and tick off all the transactions. Up-to-date anti-virus and anti-spyware on your pc. Other than that – not sure! The thing is I don’t even trust cold calls anymore, I actually ring them back, but not necessarily on the number given in the call unless it checks out somehow (eg: correspondence, phone book). Also, I have heard of many frauds being committed via snail mail as well. Almost like it’s not safe anywhere. I guess that’s where commonsense has it’s place. Ditto. Some ppl are getting smart these days and sending you text messages and voice mails telling u to call at a certain #. They claim to represent legit banks or companies, but just are probably Nigerian scammers. I get a few of those as well – I just ignore them. I bet a lot of peope don’t though. Andrew recently posted..Blog Expert Series- Get Your Readers Begging For More! .-= Julius´s last blog ..Can Blind People See? =-. Have I been scammed by this comment? This is Tom’s blog you are linking to! info. A few weeks later, Fed Ex comes to visit him with his brand new PS3. I guess he was the exception. I certainly wouldn’t do that. Ha. neither would i. he said that he had(has) a lot of protection on his credit card. and he is the most meticulous person i’ve ever met. never wasted a dime. so he took the risk, knew to things to watch out for if he was being scammed, and got a PS3 out of it. he just wanted it as a Blue Ray player. We’ve been fortunate and haven’t been scammed. We once were big eBay users and had a store back when it was cost effective. We were amazed at the elaborate lengths some folks would go to, to scam others. You no longer have an e-bay store? What did you sell? No, the fees went up, and we went out! We sold all sorts of stuff. Mainly buying something low, then selling high. For instance, for a half year or so we purchased Trek road bikes for $2,000. then sold them for $3,000, all done on eBay. Lasted for a half year before other folks starting doing the same. It’s a shame the fees now outweigh the benefits. Yup! When the fees were reasonable having an eBay store was a hoot. eBay is now the ‘Wal-Mart’ of online money making. Not a whole lot of money to made there these days. .-= Colleen@Kennewick Real Estate´s last blog ..West Pasco Washington Columbia River Postcard Day =-. I haven’t been scammed online up till now but I have to admit that there were a few very close ones. Like I open my mail and see a mail from Ebay. A question about a product I was selling so I opened the mail clicked the link to go to the login. Right after filling in my details (before clicking login) I got a bad feeling somehow and checked the URL. It was nearly the same to Ebay URL but I noticed. It really amazes me how clever they are and with the new tricks they come up with. I’ve had a few of those over the years as well. Funny thing was at the time I received the email I knew I wasn’t selling anything! Great info Andrew. I do know what you are talking about. For so many out there it is just about making money and NO customer service. I do have to say after taking part in your blogging class you go way beyond customer service. Your course is wonderful and the cost is so affordable. And customer service is first on your list. .-= Debbie @ Happy Maker´s last blog ..T-Shirts =-. Kind words, Debbie – thank you! I’ve only been scammed once and that was enough. I’ve actually started a blog whose sole intention is to warn people of scams that I come across and it gets quite a few hits from the search engines and many comments from grateful visitors. Nice one – good idea for a blog. How do you overcome the fact that some people might think you are scamming them by talking about scammers? P.S. You wife spends all your money? Well, I’m not selling them anything, nor am I trying to get them to sign up for a list or anything so I reckon all they can get form that particular site is free information. .-= Sire´s last blog ..You Can’t Please Everyone So Stop Trying =-. I understand – nice approach. I’ve only had one issue where I paid for some articles to be written that were complete copies of existing content. .-= Mike Roosa´s last blog ..Your Guide To Six Figure Blogging =-. I’ve had some rubbish articles written for me as well. I now have access to a brilliant writer – can send you the deails if you are interested. Some are pretty clever, disguised as official messages from Facebook or some other service I use, only difference is that the link takes you to a whole another website, capturing your username and password if you fall for it. All in all, I’m careful with anything that comes to my email, unless it’s from someone I know (e.g. a list I’ve opted-in to). And from websites, I always look for personal information, photos, name, etc. A site without those is run by a person who has something to hide… and I’m gone. A very sensible approach. You get a gut feel sometimes, don’t you? Yeah, when it feels right, it just does and the other way around. .-= Antti@Zemalf.com´s last blog ..You are losing money with your slow blog! (and how to fix it) =-. That’s great news – keep me posted on your products progress. When I first came online in early 2000, I was scammed in a website deal. It’s a little complicated to explain, but luckily I was only out about $200…and months of time. I’ve had a few clients who – not really scammed – but have paid $thousands for a website and then have to pay the company every time they want a change – min. cost $100. They come to me to get them out of their contract and get them over to WordPress. Perhaps that is classed as being scammed? Ripped off – definitely! .-= Andrew @ Blogging Guide´s last blog ..Working From Home: The Pros and Cons =-. I’ve seen those many times myself. i don’t want my blogs hacked for saying this, but 9 outa 10 times those are cases of the client rushing in, not reading all the fine print. …and being naive to what else is available. Accidentally deactivated – sorry! Back now! .-= Andrew @ Blogging Guide´s last blog ..Read This If You Like Free Stuff =-. I’ve had ones where I’ve won a cruise – all I have to do is sit through a 4-hour timeshare presentation. 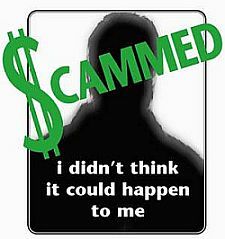 If I say about scam then I will say that after getting involved in scam I entered in the internet marketing field. I have lost my money for doing work at home. One of the scam website who promise to make big money for doing online ad posting jobs, for which I paid then something Rs. 3000 in Indian currency. After completion of my work when I asked them for payment they refused to pay money and when I was calling them again and again, they even did not received my call. This is the reason why I make my blog on work at home niche. I want to inform visitors about legit work at home program and how to stay away from the scams. Good on you, Chandan, re: your blog. Sorry to hear about your scamming experience. It reminds me a few years ago now – way before internet and blogging. My wife paid some guy £20 to register as a home typist. He promised weekly work after she paid the £20. No work ever came and it was a fake telephone number. .-= Jorgen Sundberg´s last blog ..Social Bookmarking Made Easy by Caroline Middlebrook and the IMAutomator =-. They hide and can never be found! Hey bro, this day I’ve got e-mails that some one wants to send me thousands dollar, lol! But who’s gonna get so much money with no effort at all? I don’t buy it! .-= Latief@AnotherBlogger´s last blog ..Interview With Aswani Srivastava From Future Perfect Blog =-. I get quite a few of those type of scam emails every day. Sorry, you can’t buy my product yet…soon I hope. It is really appreciable what your are doing. Internet is flooded with scams. I myself have bought a number of courses and found that some of them were just craps. You blog building tips and instructions are worth reading and really useful too. Thanks a lot. Thanks for those kind words – I really appreciate it.